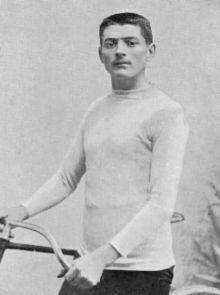 Sunday 15 December, 1895, had seen Jimmy suffer a rare defeat when he fell during the fourth lap of a 100 kilometre race at the Velodrome d’Hiver. The winner, Willie Lumsden, was later to complain to the manager of the velodrome regarding the docking of his prize money to pay for the pacemen, further refusing to ratify another match against the Welshman. Tension between Jimmy and the Linton’s was also to the fore when Jimmy wrote an open letter to Sporting Life in January 1896 responding to boasts by Tom Linton in the South Wales press that he could beat Jimmy and that Arthur was ‘champion of the world’. Claiming that he was “middle-distance champion of the world”, Jimmy laid down an open challenge to both brothers to race them at either the Velodrome Buffalo or Velodrome d’Hiver over distances of 100 kilometre or 100 miles, or in a 6 hour race. The race never came off and it is not difficult to see Choppy Warburton’s hand in what may well have been a ploy to drum up further press interest in the exploits of his three most successful riders. On the track Jimmy was in fine form. On January 26 a crowd of 15,000 gathered at the Velodrome d’Hiver to watch a best of three match series between Jimmy and the French short distance champion, Edmond Jacquelin. The bill comprised 2 kilometre, 10 kilometre, and 5 kilometre race, each to be paced. Riding a Gladiator bicycle with a Simpson chain and Dunlop tyres Jimmy beat the 2-1 favourite Jacquelin over his preferred distance of 2km, sprinting to the line while the Frenchman sat up realising he had lost. The win in the second race of 10 kilometres was even more emphatic, with Jacquelin retiring after 4 laps unable to keep up with the pace set by Jimmy who rode on to complete the full distance at an average speed of 30 miles per hour to a roaring ovation. First to shake him by the hand were Mr Darriacq of the Gladiator company and William Stead Simpson. His next win at the Velodrome d’Hiver was less ecstatically received. Designed as a spectacle rather than a true sporting event Jimmy lined up against Amelie Le Gall who rode under the name Mademoiselle Lisette and was recognised as the fastest of the women cyclists at the velodrome. Lisette was awarded a 7 kilometre advantage over 50 kilometres and Jimmy caught her after 31 kilometres. The crowd watched in grim silence, broken by the occasional caustic remark as Jimmy lapped Lisette every 4-5 laps and completed the distance in 1 hour, 5 minutes, and 50 seconds, Lisette having completed a perfectly credible 38 kilometres in the same time. Here’s good health and wealth to the knight of the wheel”. As enjoyable as his break may have been the need to earn his living remained constant. In February the Merthyr Times and Dowlais Times and Aberdare Echo reported that Jimmy intended to rest before training for a meet at the Agricultural Hall, London, in late March. Three exhibition rides were planned for the week-long event, 10 miles on the Monday, 20 miles on the Wednesday, and 25m miles on the Saturday. On March 30 Jimmy attempted to break the 5 mile record at the Agricultural Hall but failed to do so after recording three false starts thanks to faulty starter’s pistols and a rifle that failed to go off, and a problem with a pedal that forced him to abandon the afternoon attempt. He returned to the track in the evening but ended 1 second slower than the record set the previous Monday. By April 2 press reports were claiming that Jimmy was prepared not to ride at the Agricultural Hall if the rival Olympia track paid him £100 to ride there instead. A deal must have been struck as the following Wednesday saw Jimmy break the world records for 4 and 6 miles at the Olympia, followed by the 5 mile record on Saturday 11 April. A few days later the Evening Express reported that Jimmy had entered into an agreement to not attempt record breaking rides at any track other than Olympia. April also saw a flurry of press speculation about Jimmy’s private life as reports circulated of his secretly conducted marriage to a young and wealthy lady from Coventry, alleged to be a fan who had gone to Paris with the purpose of meeting him. The cycling columnist of the South Wales Daily Post, “The Wheeler”, was scathing of these and other reports that the marriage was in fact to the daughter of Jimmy’s previous employer, a butcher from Aberaman who had given Jimmy his first bicycle. As a one-time near neighbour “The Wheeler” dismissed the report as he knew for “an absolute fact” that Jimmy had only been employed in his grandmother’s butcher’s shop as a delivery boy. Jimmy had in fact married Frances ‘Fanny’ Lewis the daughter of Aberaman butcher, David Lewis, on 13 March at Cardiff Registry Office. As Fanny was not yet 18 the marriage had been kept secret. Back on the track Jimmy’s next target was the world hour record, regarded today as the blue riband event in any cyclist’s career. 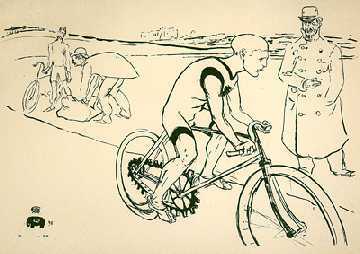 The first recorded hour record was that of the American rider, Frank Dodds, who covered 16.471 miles on a penny-farthing in 1876. Twenty years later 12,000 spectators flocked to the Wood Green track in London on Saturday 16 May, 1896, in high expectation that Jimmy would be the first to cover 30 miles in 60 minutes of riding himself into the ground. As with all his races Jimmy was to be paced around the track and the French pacemen from the Gladiator team were on hand to help. The pacemen, understandably concerned for their safety, refused to ride the “sixtette” that had been built for the occasion, lacking confidence in the soundness of the machine at full speed. After an hour Jimmy had failed to hit the magical mark of 30 miles, and had covered 28 miles, 1634 yards, just shy of a quarter of mile less than A. A. Chase had recorded for the hour at Wood Green the previous Thursday. Choppy initially blamed the weather, later laying the responsibility for Jimmy’s failure entirely with bad pacing. Friction between the pacemen and the star riders was not uncommon, with the former arguing that the record times achieved by the latter were only possible because of the help the pacemen gave to the likes of the Linton’s, Huret, Jacquelin, and Jimmy. At the Velodrome Buffalo on the Thursday prior to Jimmy’s hour attempt the pacemen had sought to renegotiate their fee with Tom Linton at the start of a 50 kilometre race. Linton, realising he would be out of pocket if he agreed to their demands, left the track leading to uproar among the waiting crowd and a riot ensued. Choppy harangued the crowd from the railings but no-one understood what the Lancastrian was saying. The police collared him and the crowd, fickle as crowds can be, rushed to his aid, released him, and carried Choppy off in triumph. Blame was laid squarely at the feet of the pacemen, who were banned from the Buffalo and the Velodrome du Seine. Pacing was clearly important to the success of the elite professionals but a more likely explanation for his failure to break the hour record may be that Jimmy, who had not often been riding competitively in the preceding weeks, was experiencing a dip in form. Such scenes as those at the Velodrome Buffalo were uncommon but they serve to highlight the tension within the world of track racing where huge sums of money could be earned by an elite few. At a time when a typical manufacturing worker in England earned £30 to £40 a year the sums that could be won in track racing were phenomenal. Jimmy was rumoured to be earning £150, several times that sum, for one week’s racing in Olympia alone. Typically he might earn £80 for a win, £60 for a defeat, and bring in £1,500 to £2,000 a year from appearance fees, winnings, and retainers paid by the likes of Gladiator, Simpson, and Dunlop, who paid Jimmy to use their equipment. With such high rewards on offer the incentive to perform was extremely high. Ten days after Jimmy failed to break the hour his rival and stable-mate, Tom Linton, became the first to go over 30 miles in a ride at the Velodrome du Seine, Paris. Jimmy, continuing to ride in Britain, achieved a run of record breaking successes at the Olympia. Between Wednesday 27 and Saturday 30 May he set world records for 3, 4, 5, 6, 7, 8, and 9 miles respectively. These achievements were a prelude to the ‘Chain Races’ held at Catford Track on Monday 8 June, 1896. Since November Jimmy had been riding on a Simpson lever chain following William Stead Simpson’s challenge offering ten-to-one odds that riders using his chain would beat those riding with standard chains. The meeting at Catford offered a programme of three races at 5 miles and 50 miles, and 1 hour. Jimmy was lined up to ride for Simpson in the opening 5 mile race against C. F. Barden of Putney Athletic Club. 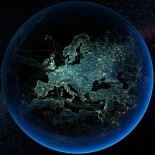 The facts of what was to unfold next have never been fully established. The 5 mile race was the first event on the card. The start was delayed as Jimmy, accompanied by ‘Choppy’, did not arrive at the track until shortly after the scheduled start time. During training rides the night before a disagreement between Jimmy and the organisers led him to threaten not to ride the following day and he was told that his services could be dispensed with. After what we can assume to be fraught backroom negotiations an agreement that he would ride both the 5 and 50 mile events, as previously arranged, was reached. As events turned out Jimmy was a dismal failure. Barden outdistanced him after 2 miles and Jimmy abandoned the race after 3 miles, reportedly dizzy and ill.
With the standard chain team one up in the match, next to ride were Tom Linton (Simpson) and J. W. Stocks of Catford Cycling Club. Linton took the lead after 7 miles and finished the hour with a new British professional record of 29 miles, 643 yards. The 50 mile race was won by the Simpson rider, Constant Huret, nicknamed ‘Le Boulanger’, who was thrown into the race after Jimmy’s collapse meant he would not be available to ride. Having been lent Tom Linton’s bike Huret proceeded to set a new world record of 1 hour, 45 min, and 50 seconds. The Simpson riders had won the match 2-1, the popular consensus being that this proved as professionals they were the better riders, rather than that the Simpson chain was in any way superior. Initially Jimmy claimed that he was let down by his pacemen getting in the way but darker rumours quickly flew around the Catford Track. The “doyen of cycle journalists” alleged that while the hour race was being contested he had heard Jimmy openly state that he had been drugged. Elsewhere a well known Cardiff cyclist expressed his opinion that Jimmy had lost the race after breaking down as a result of too much hard work. Three weeks later Jimmy was reported as saying that he had done little work in recent months and had not been at “concert pitch” when he was beaten in the ‘Chain Race’. Relations between Jimmy and ‘Choppy’ had been fraught for some time. 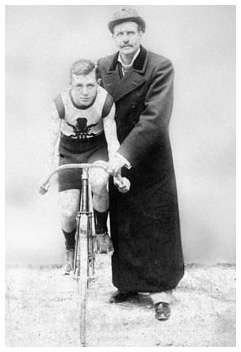 In early May Bicycling News had reported that Jimmy had severed his connection with ‘Choppy’. Though the break was short-lived, with the 13 May Pink edition of the Evening Express reporting that they had settled their differences, the ‘Chain Race’ affair was the catalyst for a complete breakdown between the pair. The partnership was dissolves shortly after the race, and when Jimmy accused ‘Choppy’ of poisoning him the ex-trainer issued a suit for slander, which was apparently later settled out of court. The exact reasons for the breakdown in their relationship are unclear but it is not unreasonable to read between the lines and see in Jimmy a young man who while benefiting from ‘Choppy’s experience and management experience had begun to have ideas and ambitions of his own. On his part ‘Choppy’, a businessman before all else, was bringing through other young riders including his own son, and Jimmy, still only 19 years old himself, may have felt that ‘Choppy’ was not investing enough in him. Though the end was acrimonious the relationship had benefited them both and it is arguable that without ‘Choppy’, Jimmy may not have achieved the success he did. Reinstatement allowed Jimmy to finally meet the American champion rider, John S. Johnson, on the track. A series of races between the pair had been agreed in November 1895 and postponed as a result of Jimmy’s suspension. They finally met at Wood Green on 11 July where they competed over distances of 1 and 10 miles in front of 2,000 spectators. Johnson, a sprinter rather than a distance rider, easily won the shorter race. Over 10 miles Jimmy proved the faster, winning by almost a lap. It was his first success against American competition. It was not to be his last. “Cycling,” Merthyr Times and Dowlais Times and Aberdare Echo, December 18, 1895, 3. “Football and cycling,” Evening Express, January 22, 1896, 5th ed., 3. “French cycling notes,” Evening Express, January 29, 1986, extra special ed., 2; “Local siftings,” South Wales Daily Post, January 31, extra special, 4. “The world’s champion cyclist,” Merthyr Times and Dowlais Times and Aberdare Echo, March 12, 1896, 3. Cycling,” Merthyr Times and Dowlais Times and Aberdare Echo, February 27, 1896, 3. “By the way” Merthyr Times and Dowlais Times and Aberdare Echo, April 2, 1896, 6. “Cycling,” South Wales Daily Post, April 10, 1896 extra special ed., 2; “Cycling,” Evening Express Post, April 13, 1896 extra special ed., 2. “Michael,” Evening Express, April 17, 1896, 1st ed. 2. “Cycling, ” South Wales Daily Post, April 23, 1896, extra special ed., 2. “”Jimmy” Michael Divorced,” Weekly Mail, June 24, 1899, 4. “Cycling,” South Wales Daily Post, May 19, 1896, extra special ed., 4. “Cycling,” South Wales Daily Post, May 26, 1896, extra special ed., 2. “Cycling,” South Wales Daily Post, May 28, 1896, extra special ed., 3; “Cycling,” South Wales Daily Post, May 30, 1896, 5th ed., 2; “Cycling,” South Wales Daily Post, June 2, 1896, 2. “Welsh cycle champion Michael makes a grave charge,” Evening Express, June 9, 1896, 5th ed., 3. “Cycle chain matches,” Evening Express, June 8, 1896, 1st ed., 3. Evening Express, June 10, 1896, 3rd ed., 2. “Cycling notes – no. 1,” PontyPridd Chronicle and Workman’s News, July 31, 1986, 6. “Michael suspended,” Evening Express, June 22, 1896, 3rd ed., 3. “Athletic notes. Cycling,” South Wales Daily Post, June 27, 1896, extra special ed., 3. “Cycling,” South Wales Daily Post, July 3, 1896, extra special ed., 4; “Cycling,” South Wales Daily Post, July 10, 1896, extra special ed., 2. “Cycling,” South Wales Daily Post, July 13, 1896, extra special ed., 2. “National Cyclists Union,” Evening Express, October 29, 1896, 3rd ed., 2. “Michael, the little wonder, breaks off his connection with Choppy Warburton,” Evening Express, May 6, 1896, extra special ed., 2. “Michael and Johnson,” Evening Express, July 8, 1986, 3rd ed., 3. “Cycling,” Evening Express, July 13, 1986, 1st ed., 2. This entry was posted on October 11, 2014 by aaroncripps in Britain, Cycling, History, Nineteenth Century, People, Wales, Welsh and tagged Cycling, Cyclist, James Michael, Jimmy Michael, Little Jimmy, The Midget Cyclist, Track Cycling, Wales, Welsh History, World Champion.